U.S. Latinos say it’s important for future generations of Hispanics to speak Spanish, and the vast majority speak the language to their children. However, the share of Latino parents who ensure the language lives on with their children declines as their immigrant connections become more distant, according to a new Pew Research Center analysis. Overall, 85% of Latino parents say they speak Spanish to their children, according to the Center’s 2015 National Survey of Latinos. Among immigrant parents, nearly all (97%) say they do this. But the share drops to 71% among U.S.-born second-generation Latino parents (those with at least one immigrant parent). And the share falls to just 49% among third or higher generation Latino parents – those born in the U.S. to U.S.-born parents. Spanish use also declines in mixed families where one spouse or partner is non-Latino. 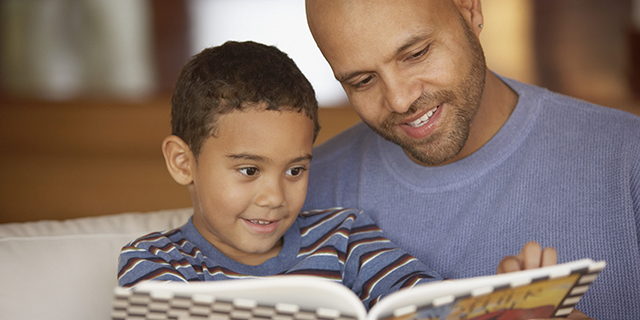 About 92% of Latino parents with a Latino spouse or partner speak Spanish to their children. By contrast, just 55% of Latino parents with a non-Latino-partner or spouse say they speak Spanish to their children. Besides speaking Spanish to their children, Hispanic parents can pass on the language by regularly encouraging their children to speak it. About 70% of all Hispanic parents say they provide such encouragement often, but again, successive generations are less likely than immigrant parents to say they do this. Spanish has long been a part of life for today’s Latino adults. Nine-in-ten (90%) say Spanish was spoken in their home when they were growing up, and 81% say their parents often or sometimes encouraged them to speak Spanish when growing up. (Notably, 20% of Latino adults say their parents often or sometimes discouraged them from speaking Spanish when growing up.) Today, nearly all Latinos (96%) say their parents speak Spanish, and unlike some other language measures, this share holds relatively steady across generations. 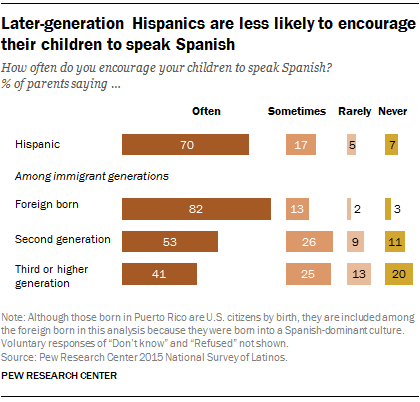 Not only do nearly all Hispanic adults have a personal connection to Spanish, they also express a desire for the language to live on: 88% say it is important to them that future generations of Hispanics living in the U.S. be able to speak Spanish, with vast majorities holding this view across generations. The Center’s 2015 survey findings also show that Spanish dominance is on the decline among second- and third-generation Latinos. While 61% of Hispanic immigrants in the U.S. are Spanish dominant (and another 32% are bilingual), the share who are Spanish dominant drops to 6% among second-generation Hispanics and to less than 1% among third or higher generation Hispanics. Meanwhile, the share of Hispanics who are English dominant rises across generations: Just 7% of immigrant Hispanics are English dominant, a share that rises to 75% among third-generation Hispanics. Overall, about 40 million people in the U.S. speak Spanish at home, making it the country’s second-most spoken language. At the same time, growth in the number of Spanish-speaking Hispanics has slowed, according to the Center’s analysis of U.S. Census Bureau data. As a result, the share of Hispanics who speak Spanish at home has declined, while the share that speaks only English at home has increased, especially among children. These trends are expected to continue as Hispanics born in the U.S. increasingly drive the group’s population growth, in large part due to slowing immigration from Mexico (and, to a lesser extent, high intermarriage rates). Already, most U.S. Hispanics say a person doesn’t need to speak Spanish to be considered Hispanic.